I have been reading more and more posts on the web promoting different RAW converters over ACR, and alluding to the finest hairs of difference. I believe these are the same people that post on why only the finest lenses are usable, or that only certain cameras are sufficiently sharp to be used. I believe these people should be required to read some of your recent posts on these subjects first thing every morning for a year. Is it the appearance of digital over film or the coming of the web that has caused this tsunami of foolishness? I normally shoot JPEG in my D800 and only use RAW for something with extreme range; sunsets or very dark scenes. This doesn't seem to be a popular view, but I like having a powerful computer with an amazing database of experience work with me. I've done decades of manual work, and I really appreciate automatic aids that work my way but faster. I like to get it right, in-camera. My pro retoucher says that there is no difference between my CR2 files, that she converts, and my JPGs. Mike says: There's a good reason why a lot of people prefer to use out-of-camera JPEGs with Fuji—they look great, they're easy to work with, they have no artifacts, they're sharp, and they have great color. "Who knows, maybe the best raw converter for Fuji X-Trans files is inside the camera." That's the only one I ever use. Exactly. I don’t have time to piddle around with raw files. That is why I predominantly shoot with Mr Fuji. His jpg’s are exempliary. As an aside Michael, the English Open snooker final is almost entering it’s 10th hour. Bingham v Davis and it’s 7 apiece, with 3 frames remaining. Unlike O’Sullivan’s frantic pace, this match is cool, calculated and full of crafty snookerings. Hi Mike, I'm a LR user since 2004 and a Fuji user since about 2013. I too, have never seen a mushworm. That said, I do notice a subtle difference when using C1 (I prefer the default colours, but I'm not unhappy with LR colours) and when I can be bothered putting images through Iridient I sometimes find it worth the effort. As I don't fetishize sharpness, I'm usually not bothering. I have been working with Fuji raw files for a couple of years now. I had not heard of the possible difference between Photoshop and Lightroom raw conversions but as they use the same 'engine' I think it unlikely. I will do some tests and let you know. The 'worms' can really only be seen on some types of image, in particular ones which have a lot of detail in foliage, and then only when blown up big (probably too big, they are rarely seen in 50x40cm prints). Having said that, for some images I can get a result that is a little better by running the raws through Iridient X-transformer before working in Lightroom. If you have the patience to learn how to deal with raw files you will reap the benefits. JPEG is 8 bit, raw is 12 or 14. Therefore there is considerably more dynamic range available in raw. Sharpening and white balance are not baked in. You can change them as desired afterwards. All the Fuji film simulations are also available for raw in Lightroom and are very close to the ooc versions. I am not saying that photographers that shoot in jpeg are wrong to do so, but when you have a difficult image you will be glad for that raw file. Shoot in raw and jpeg and you can choose which to use afterwards. Amen, Mike. After agonising, and trying various alternative RAW developers for my Fuji X-Trans files, I finally decided that I was best with ACR and then doing whatever else I could manage in PhotoShop. One point though: I believe I've seen enough about the different teams working on ACR/PhotoShop vs Lightroom to convince me that they are not using the same engines, even though they may swap ideas. My two bits worth. Be sure to read the update for the XTrans 3 sensor. Folklore had it that's its in the sharpening mostly, not in the raw development per-se. I say "had" because I've not used Fuji for 3 years so I'm happy to be corrected, trashed, whatever. I didn’t find an advantage of C1 over Lightroom when I compared them for gfx files. Fuji's X Raw Studio might be the answer for anyone wanting to work with RAW photos but doesn't trust Adobe, etc. You transfer the photos to your computer and then connect your camera. X Raw Studio then uses the camera's computer to make changes to the RAW files. So you're able to get Fuji's great JPEG conversions on your computer. That said, I don't like the extra work and try to get JPEGs right in camera. Its true the the in-camera to JPEGs by Fujifilm cameras is excellent, but sorry, ACR doesn't hold a candle to Iridient Developer or Capture One for RAF demosaicing and sharpening without producing artifacts. Capture One also has the ability to pull up shadows and pull down highlights with its High Dynamic Range sliders without crushing down the tonal range to nothing but muddy grays, which LR/PS cannot do. And with the release of C1 11.3, one can now convert GFX-series medium format RAF files! I've been converting some of the files I shot for my review of the GFX50S for TOP, and they are, in a word, glorious. Good lord. I hope you'll post your impressions of the X-H1; its become my go-to professional workhorse and the image quality from it is really exemplary, reminding me of the GFX in overall character. I think its been built to incredibly tight tolerances that extracts the maximum optical performance out of the Fujinon lenses. Its not your father's X-T2, though, its a mini-GFX. 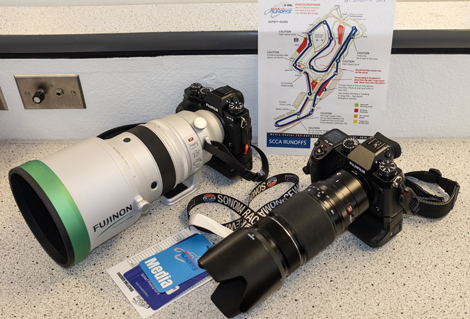 Speaking of Fujinon lenses, Fujifilm NA sent me, on a very short-term loan, their spectacular new Fujinon 200mm f/2.0 to test for motorsports (along with the new X-T3). I have seen the "worms" using Lightroom 4 with X-trans, but only once on a series of several photos a few years ago. It very noticeable on dark soil in those photos. I have not seen anything like it since, nor have I noticed a problem with green vegetation but I have no doubt they exist, or at least existed. By the way, Thom Hogan and others saw the problems with the earlier Fuji jpgs too, so at least back then, using jpgs was not the answer. I use LR for cataloguing and quick edits, tonal adjustments, global colour. It's quick and easy. But I leave the sharpening sliders well alone (or even turn them down). If you want to see some nasty X-trans artefacts as reported, turning up the wick on the detail slider will do the trick. I then open all files in PS for 'finishing'. That includes a quick smart-sharpen and, if resized, a follow up with USM. Ah, the joys of inherited wisdom. When I borrowed an XT-1 from Fujifilm Australia to use back when it was first released, the inherited wisdom was right: LR didn't do X-Trans raw conversion all that well. But that was four years ago. ACR and LR have come along in leaps and bounds and it's pretty great now, although I still use Iridient for big prints with a lot of foliage and fine detail and it makes a small, but noticeable difference. After decades of printing black and white negatives I have come to appreciate the mystery of the out of camera product. Raw files while no mystery do allow for some mastery in creation of a print. JPEGS, to me, are reminiscent of shooting transparency, best viewed by projecting upon a screen. Iridient is the converter I use for my two Sigma DP Merrill cameras. It does a fine job with those raw files, certainly works better than Sigma's software. I use it for broad strokes on the raw, as if I'm developing film, and then I use Lightroom for the tweaks, as if I'm making a print in the darkroom. The Sigmas, as many know, are "delicate geniuses" (Seinfeld reference) and so you do what you gotta do with them, take all the pains you can for that rare chance of getting some gold. I should think I'd be a bit frustrated, though, if that was my workflow for a less eccentric camera like a Fuji. From everything I hear about them, I could see working with the JPEGs (as you mention, Mike) or Lightroom's raw converter (as you apparently do) just to see what I've got, and for most things that'd be good enough. But then for that extra special file, go the extra mile, restarting the whole business on the raw with something like Iridient. So I guess this is my plug for giving Iridient a try. Curious to hear what you think, should you choose to. It is not a matter of one being good and another being bad of course. I have seen some dramtic differences in noise in shadows between LT and C1 in exactly one of my pictures :) C1 noise reduction appears to be better than LR for my Fuji raws. I have verified to my satisfaction that developing a Fuji raw in LR without sharpening and using smart sharpening in Photoshop gives as good resolution and details as anything else, provided I do not use any noise reduction in LR. I still switched to C1 following the availability of C1 Pro for Fuji as a perpetual license. Besides the licensing issue, I enjoy the great editing toolset of C1: a great RAW development environment with all the layer functionality I'll ever need all in one tool that does not need me to break the flow of working like when switching from LR to Photoshop. And C1 gives me the best B&W toning facility I have ever had. Be careful, you may be caught in the ... wormhole! I too use LR and can't fathom what folks talk about. I like the results from my XPro2 very much. I guess finding the right raw converting software can be a challenge, I typically use ADOBE DNG Converter and have discovered that for FUJI raw files I must change the version on DNG back to version 5.4 vs any version after that. The artifacts that were produced on Fuji files using any version after 5.4 were quite ugly. It prompted me to start using the FUJI out of camera jpegs instead of the raw files until I discovered the flaw and made the version change in my file process procedure. I wonder if this may be the case for other raw converter programs? Mike, you need to try the latest version of LR Classic. I have found that over the years that the Fuji raw files have worked better and better with the later version of LR. For a while I stopped using raw files and just used jpegs but it was mainly because it took too long to download and work on raw files. As LR got better I switched back to raw and is what I use now with no problems. Another +1 for Fuji's X Raw Studio. Weird tool, but it’s very nice to edit raw files and remain in the Fuji simulation mindset. Okay, just to clear up some possible misconceptions about the "disruptions" to workflow that using Iridient Developer poses for converting Fujifilm X-Trans RAF files: the entire "out-and-back" of launching the Iridient LR plug-in, running the conversion and closing takes all of....30 seconds. Moreover, there tweaked demosaicing/sharpening presets for B&W vs. color photographs, and Iridient also has significantly superior highlight recovery tools to LR/ACR. For those folks who cannot afford to spend the 30 seconds required to convert large numbers of X-Trans RAF files, e.g. wedding or event photographers, I would strongly recommend transitioning to Capture One 11.3. Not only does it provide superb RAF conversion, but it is significantly faster than LR at importing files and building image previews. 1) why does DxO not support X-trans files? They do support the original X-100 which is not X-trans. 2) why are the medium format models not X-trans but rather classic Bayer ? Isn't is still true that jpegs are a lossy file type whereas RAW files can convert into Tiffs etc. that can withstand lots of manipulation where required without going bad on one, unlike jpegs? Of course, with all things known to man getting better and better, even if invisibly, I might be mistaken. I use Fuji mostly for portrait work because the JPEGs are generally excellent out of the camera so I don't have to spend as much time on the computer. But when needed, I use Photoshop/C1/and Alien Skin and all work fine for both color and Black and White - each software has its own features but none do less than a great job with the Fuji raws. I have the Fuji H1 and I find it to be excellent. I don't understand the collective "meh" response. Yes it doesn't have the perfectly balanced classic look of the T2/T3 but to my hand it "looks" significantly better than the T2/T3. Some lucky people are going to get a fantastic camera for a quickly reduced price because of the poor market response. Dealing with fine green details, I can still see a difference in Fuji raw processors. Say, something like a tiny fern. Yes, there are still the occasional bits of gummy bear rendering though it's greatly reduced from older LR versions. For almost all other photos LR is more than good enough. Sending the occasional landscape through Irident is not a big imposition. I get the convenience of LR with option of pulling the finer detail when I absolutely need to. I only use Photoshop when I have a lot of sensor dust or need to remove an unavoidable distraction. Where I see artifacts in Fuji raw files is in fine details like tree branches & leaves. They looked processed or rendered, enhanced. I found that Irident X-Transformer is a very good low-cost utility that I run Fuji raw files through, then open the DNG files in Lightroom for adjustment. Fuji jpgs are excellent, better than I've seen from any camera, but if you need to work the image for any reason, pull shadows from high contrast lighting, for example, the jpg files fall apart pretty quick. Based on your previous posts Mike, I assume you've rented the X-H1 to try out its IBIS with unstabilised lenses, like the Fuji primes. Would it be too much to ask you to comment on how practical its IBIS is for hand-held video? I don't shoot video a lot, most I shoot stills. But from time to time I want to shoot video in situations where I can't or it's not practical use a tripod, and where a gimbal would be overkill, as I'm not moving around all that much. Lens stabilisation helps but doesn't really cut it for longer videos. So the question is - would the X-H1 do the trick? Back when the alternative was the X-T2 the decision was mostly a size and price decision, but now there's the X-T3, so the decision is IBIS vs the best all-rounder plus a gimbal. I am among those who frequently see the worm artifacts in Fuji X-trans files and find them bothersome (which is not quite the same as important). As shown in the example posted by Mike, the worms are structures that appear at the level of just a few pixels, which says to me that the X-trans filter array, the demosaicing algorithm and sharpening can all potentially play a role, especially since the demosaicing and sharpening are controlled in different ways in different programs. This makes it pretty hard for most of us to sort what is going on. for the modest price of 4.88 Euros. The book provides a nice guide to the interface and some useful suggestions regarding the demosaicing and sharpening settings. In particular, the Irridient Reveal sharpening algorithm provides two detail settings: edge-detail and texture/micro detail, and Fitzgerald suggests turning down the texture detail setting to minimize artifacts. In my limited experience, this does seem to be the best way to minimize the worms. Personally, I prefer to process RAW files, rather than use jpegs, for the relatively small number of images that I print. JPEGS do still suffer from the problems of limited bit depth and lossy compression each time the file is modified and saved. But, this loss shouldn't occur when using a non-destructive editor such as Lightroom. When I first bought into the Fuji system, I shot only JPEGs. Probably because of all the internet postings about how great they are and how Fuji's film simulations are so wonderful. Truthfully, I hated the Fuji colors. Red was orange and everything was too warm and saturated. The B&W JPEGs were not really bad but I knew I could do B&W better. And I never was comfortable shooting only JPEGs. So I just used LR6 to download and convert Fuji Raw files. But I wasn't totally happy with them. Every now and then, I would get a bit of "worminess" or the sharpening would be a little weird looking. Eventually I tried Iridient X-Transformer and it was a whole new ballgame. I'm not a prolific shooter and I'm pretty ruthless in editing so I don't end up with a lot of final images to work with. Converting the RAF files to IXT DNG files is a painless process well worth the extra steps. As I've stated numerous times, I don't have much Lightroom expertise--I'm just a muddler. I muddle through and I eventually manage to get my photos looking the way I like them. I had barely begun to feel comfortable using Lightroom when I bought my first Fuji camera and I had to start muddling all over again. But I like using Lightroom and Iridient improves it tremendously when using Fuji Raw.